Q : In your view, how far have the parties progressed on electoral reforms? There does not seem to be agreement even on the basic framework. It does not seem to be a productive exercise at this point to discuss the details. According to basic proposals, there should be 196 members elected on the basis of District Proportional Representation System (DPR), and 59 on the National List. Out of 196, there are 160 constituencies at the moment. That would be basically the First Past the Post System. Now, 59 are supposed to be on the National List, actually the number available from that category will be less. It is because there will be a correction process. The whole system may not be workable for a variety of reasons. There is a cut-off point. For 100,000 voters, there will be one member. But then, there are several anomalies. In the Jaffna district, there are seven MPs, but the population is only 500,000. The representatives of the minority parties are constantly raising the issue of equity from the standpoint of their community. For example, the Nuwara-Eliya –Maskeliya electorate has300,000 voters roughly. That may have to be broken up into three polling divisions. The basic principle is to divide the country into 20-25 electoral districts. Each district will have a minimum of three and a maximum of 16 polling divisions. An electorate like Nuwara-Eliya – Maskeliya will have to be broken up into three. If you take the Amparai electorate of the Digamadulla district, 170,000 voters are there. But, the total of the three remaining electorates in the same district is 117,000. There is an anomaly there. Then, there is also a tentative proposal regarding the multi-member constituencies. The Colombo-Central electorate, for example, has 137,000 voters. It would be difficult to have multi-member constituencies with three members each. If the benchmark is approximately 100,000 voters per member, there will be an anomaly. In terms of Article 12, equality becomes the legal requirement. If you have an approximate bench mark of 100,000 voters, then for special reasons, you will be able to make limited departures from it. This is not an exact criterion. Whatever departures are made, there has to be a rational basis that can be explained logically. Otherwise, there would be an infringement of the equality requirement enshrined in the Constitution. Then, there was also discussion whether to have one ballot paper or two papers. There was no consensus. It is definitely in favour of one paper. It must be readily understood by people. If it is so complicated, ordinary voters will not be able to grasp it. Even under the present PR system, the number of votes that are rejected is too high. That is because many voters have in their minds preference votes. They, sometimes, forget to put a cross against the party symbol. That becomes a spoiled vote. Therefore, it is important that there should be sufficient time for people to be educated about the new system. They must be familiar with that. It took quite some time for people to be familiar with the PR system introduced in 1978. From 1931 to 1978 under the Donoughmore Constitution, we had the First Past the Post System. So, voters were accustomed to different systems. The recent concept paper on electoral reforms that was distributed, specifically stated that the next elections would be conducted under the existing system. I think there is agreement on certain fundamentals to some extent. One is that there should be a member representing the electorate who is identified. That is one of the weaknesses of the present system. Today, members are elected under the District PR system. There is no one specifically responsible for a particular electorate. Here, you have an anomalous situation where one electorate has two members. Another electorate, you has no member. There is an understandable demand that there should be an MP for each electorate or for a particular territorial constituency. Secondly, there is universal feeling in the country that the present preferential voting should be abolished. In that context, there is agreement. It is seen as the root of corruption. You have to spend for the entire district. There is a definite link between corruption and the present electoral system. Also, the preferential voting system leads to intense rivalry and animosity within the political parties. So, the contest is not between different political parties, but within the parties. It brings out the worst in human nature. People who work amicably in Cabinet or elsewhere find themselves pitted against each other. And that introduces a large element of bitterness which survives long after the election is over. Thirdly, there is agreement on the mixed system. That is a combination of the First Past the Post System and the Proportional Representation System. That is the third proposal. There should be some increase in the total number of MPs because the population has increased. But, the question is how many. Surely, the public opinion will be hostile to the greater increase in the number of MPs. Under the proposed system, it will be 265. That is an increase of 40. I do not think that it will go down well with the public. Then, the balance between the District PR and the National List is there. It is unacceptable to have 59 on the National List. There are PR systems practised in New Zealand and Germany. In Germany, the First Past the Post System and the Proportional Representation System are equal. In New Zealand, it is 125 and 100. In Germany, the total number of MPs varies from election to election. At the moment, there is lack of clarity and direction. It requires discussion. It is unwise to rush through it. This was what happened with the 19th Amendment. This one is even more complicated because of differences among the political parties. The two major parties may be in agreement with each other on many issues. Difficulty is greater in the case of small parties. I have a feeling that we are at the beginning of a process. When you draw up electoral criteria, it must be an objective system. You cannot think of particular situations to formulate one that caters for political advantage in a given situation. Our feeling is that the minority government cannot go on indefinitely. The dominant party in the government is a small minority in Parliament. The United National Party (UNP) has only 48 MPs. But, the Prime Minister and the vast majority of Cabinet members are from that party. That was a special arrangement supposed to last 100 days. Then, the agreement was that the Sri Lanka Freedom Party (SLFP) would support, of course, with constructive criticism. We were doing it from the beginning. Now the 100 days is over. There is a strong feeling why SLFP should be doing it. Why should we keep this set up going on? It is we who provide oxygen to the set up. Then, the massive hunt of the SLFP is there. There is irony on the situation. 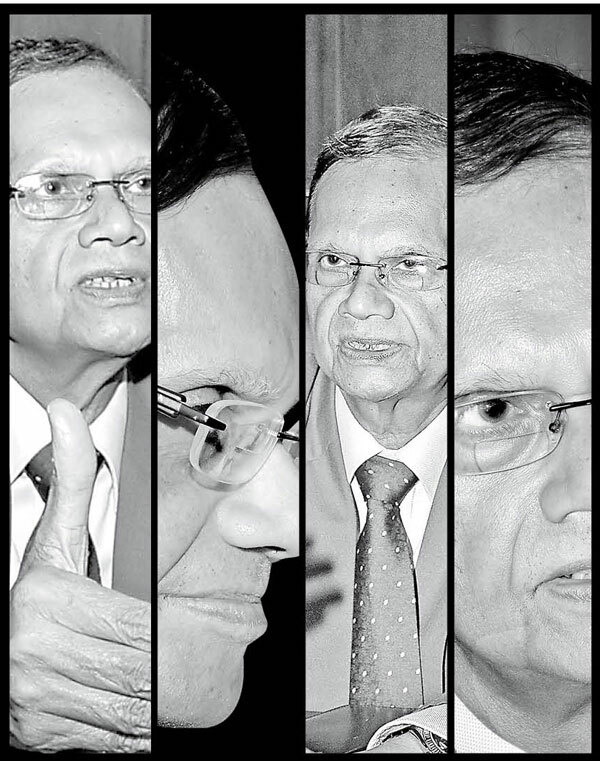 The SLFP is breathing life into a government that is hunting it down. The government cannot go on without the support of SLFP. There is a certain paradox. This situation should end. General elections are very much due. That will provide the opportunity for people to elect a government of their own. It is a majority government. We will push for the debate on the motion against Central Bank Governor Arjuna Mahendran. Out of 88 signatories to the motion, nine hold office in the government - three Cabinet Ministers, three Deputy Ministers and three State Ministers. So, the government is also party to the no confidence motion against the governor. It is not exclusively from the opposition. The Ministers of the government are supportive of it. Former President Chandrika Bandaranaike Kumaratunga has said the situation was so bad that there was no money to pay for public servants. This is hardly surprising. The Central Bank has cost too much. It is Rs.50 billion. Nothing has been done about it. Why is this matter not looked at by the Financial Crimes Investigation Unit (FCID)? This is a continuing haemorrhage. It really has to be dealt with by Parliament. The ramification of it goes beyond the Central Bank. The Bank of Ceylon is involved here. Q : But, Sri Lanka Freedom Party (SLFP) which you represent, submitted proposals. What can you say about them? There was the SLFP proposal. According to my understanding, there were three different documents. One was the Cabinet paper. Another was discussed by the National Executive Council. Besides, SLFP had its document. But it was OK to rush the 18A - that was because we - GL - did it.